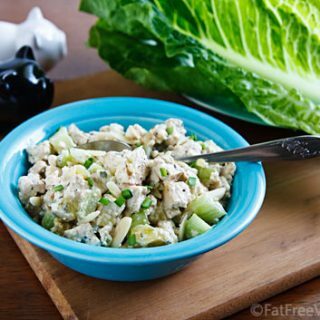 Baking the tofu gives this vegan update of the classic chicken salad great flavor and chewy texture. Make it with my low-fat mayo! It’s chicken salad the way my mom used to make it–but with no chicken, mayo, or hard-boiled eggs. So maybe it’s not exactly my mom’s chicken salad, but it’s close enough to satisfy my craving for something savory and crunchy to put between two slices of bread. 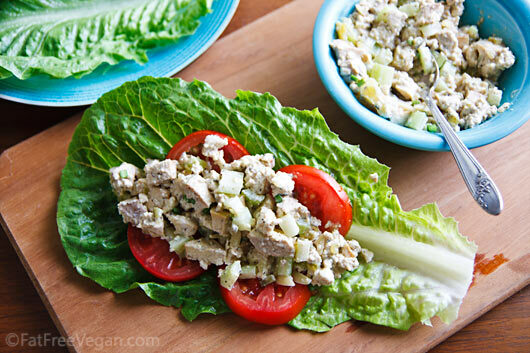 There are a lot of vegan chicken salad recipes on the internet, and while I’m sure they’re great, none of them approach the 50’s-style simplicity of my mother’s chicken salad, seasoned mostly with sweet relish and copious amounts of mayonnaise. I love a mouth-burning spicy meal just as much as the next Louisianian, but when it comes to my tofu “chicken” salad, I go old-school. Sure, you can spice this up with smoked paprika or chipotle pepper, but I like it mild and slightly sweet. Just like my mother makes–or would, if she were a vegan. Baking the tofu in the marinade is the secret to infusing the tofu with flavor, without having to wait for it to marinate. Preheat oven to 400 F and line a rimmed baking sheet with parchment paper. Cut the tofu into about 8 equal slices, and then cut those slices in half. Place two paper towels (one on top of the other) or a clean tea towel on the counter and place the tofu slices on top. Cover with two more paper towels or tea towel. Gently press each slice of tofu until the towels are saturated with water. Replace the towels on top with another layer and press until most of the water is pressed out of the tofu. Place the tofu on the prepared baking sheet. Mix the broth, soy sauce or tamari, thyme, sage, and pepper. Pour half of it over each slice of tofu. Turn the tofu over and pour the remaining liquid over it. Place it in the preheated oven and bake for about 20-25 minutes, until tofu is beginning to brown on the edges. Remove from the oven and let it cool on the baking sheet. Once the tofu is cool, tear each piece into small, irregular pieces. (You can also cut it, but it looks more natural if you tear it and somehow tastes better, too.) Place it in a medium mixing bowl and add all remaining ingredients. Mix well, and add salt and pepper to taste. Refrigerate until completely chilled. Serve in sandwiches, on top of salad, or rolled into lettuce leaves or tortillas. Nutritional information includes optional ingredients. This looks delicious. I’ve always been really skeptical when it comes to making a “chicken” salad sandwich with tofu. I’ll put tofu in stir-fries, desserts, and on the grill, but for some reason, I just haven’t been able to trust it in a sammy. I might just have to take that leap and try it out soon though! Looks like a tasty recipe. I can’t wait to try it. I am sure it will be delish. This sounds wonderful! About the tofu, though, I long ago gave up on the pressing routine with the paper towels and weights and bought a tofu press from TofuXpress. It works great and saves paper towels. (No, I don’t sell them.) Will try your mayo recipe too. And thanks for all the other great recipes. LOVE my tofu press. Gets out more water, much faster. Then you can just drain and pour in your marinade. I think, all the time, about buying another one to tackle larger recipes/servings. Also, wanted to add that, if you’re pressed for time (or you have an old fiery oven and your house is already too hot! ), Trader Joe’s baked savory tofu is also excellent in this recipe. No need to marinate or bake. Like another reviewer, I like things saucier, so I added a few more tbsp of Susan’s tasty tofu-cashew mayo. Also chopped up some red grapes and threw them in. Yum. oh yum! that looks delicious! especially wrapped up in a lettuce leaf! thanks for sharing! Looks wonderful! 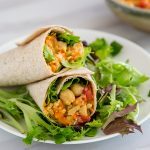 Do you think this would be good with chickpeas instead of tofu ? Well shoot…I was going to pick up tofu this morning at the market and forgot it. 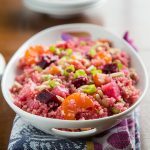 Otherwise, I had everything else – so I will have to wait for tomorrow to pick up some and try this recipe! Looks amazing! This is going to be my lunch tomorrow wrapped up in a whole wheat tortilla! Looks so yummy. Thanks so much for posting and for all the effort you put into your blog. That looks gorgeous! I haven’t made a chickenless tofu salad yet this summer. Now I have to! Wow – Great idea! Looks awesome. I love The Happy Herbevoire’s “tuna salad” – but I’m ready for some variety and this looks just perfect. 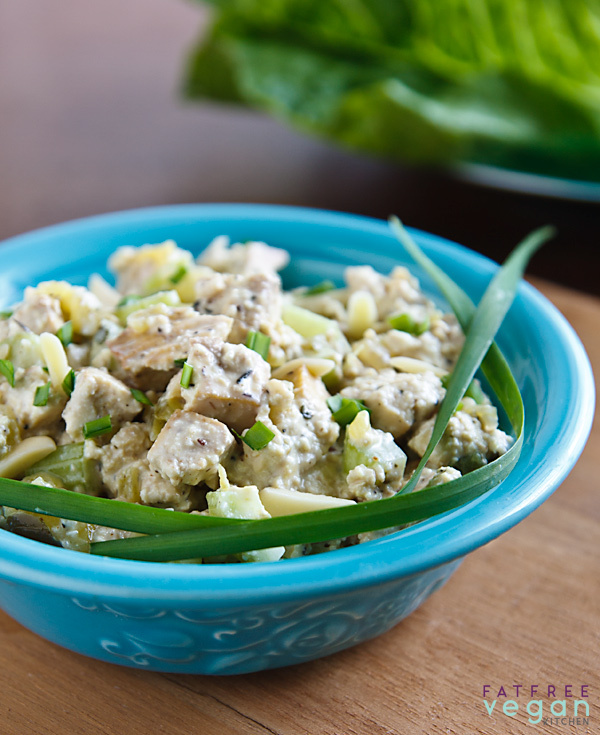 I can’t wait to make your vegan chicken salad- It looks amazing! Susan, this looks so perfectly comforting I want to stick a fork right in! Dang this screen!! 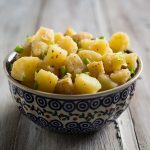 😉 I like your approach, keeping it old-school with seasonings, and I think that’s how most of us want to eat a vegan version of a chicken, tuna, or egg salad. Thanks for sharing, I will pin and tweet! i will give it a go (im one of those rare people who dislike anything with garlic ) ! Thanks Susan , keep up the good work ! This looks delicious! I’m anxious to try it. One question, it looks in the picture like there is celery in it, but it’s not listed in the recipe. Do you normally use celery, and if so how much? Oh no, I must have left the celery off the ingredients list! I used two ribs of celery, chopped. I’ll have to edit the recipe. Thanks for asking! I’m making tofu salad for sandwiches right now. My Texas grandmother put a smidge of curry powder in her chicken salad, so that’s how I make my tofu salad. It’s funny how it always tastes best the way it did when we were kids, even though it’s not chicken salad anymore. I wondered about the celery, too. I have it made and in the fridge. I think I’ll add the celery before we eat it though. I did sneak a taste and it is really good! Love the idea of baking the tofu in the oven. This looks delicious and is the perfect summer picnic food. I love to eat salads like this just like how you show in your photo…on big lettuce leaves. Hi, can you recommend a brand of good tasting vegetable broth or “no-chicken” broth? ‘Cause I haven’t found one yet. Thanks so much! The two I use are Imagine’s No-Chicken broth (in a carton) and Edward and Sons Not-Chick’n bouillon, in cube form. I’ve bought chicken like tofu in the store and it’s good but it has a lot of oil. I tried your recipe – but the tofu tasted like tofu and not chicken. Maybe I did something wrong. I’ve tried and like many of your recipes – Javanese-Inspired “Chicken” Soup is a favorite. I made this yesterday and it was fantastic! I wasn’t sure how I would like the tofu because I usually cook the heck out of it to get a dryer texture, but once it got cold, the texture was good. I had it on home made pita with some broccoli sprouts. Thanks so much for sharing. I love this recipe! I made the tofu-cashew mayo to use with it! I am making another batch of the salad right now! What a wonderful salad! Thank you for all the great recipes you post! Oh my gosh. This was delicious. Thank you! The tofu really tastes better when you tear them into pieces instead of slicing them. I love the idea of wrapping it with lettuce leaves. This recipe is perfect for summer. Do you think this could be made into a curried version? I forgot the almonds on mine 🙁 But its such a good and basic recipe, I will have to try it again and double it!. I’m with you on the doubling Aida! I love chicken salad. Can’t wait to try this version! Thanks for sharing. I made this last night and had it for lunch today. Hubby and I agree it was an excellent sandwich. There are very few things that I miss from my omnivore days, but mayo is definitely one. The tofu cashew rendition wasn’t bad and when mixed with the marinated tofu and jazzed up a bit the whole “chicken” salad was excellent. I found the mayo to be too lemony, but I use lemons from my tree and they are potent. I will cut lemon juice back to 2 to 2.5T next time. I did add a dash more mustard and maybe 1/2 to 1 teaspoon of olive oil to try to cut the lemon zing. I think this will become a mainstay in my refrigerator (and freezer). By jazzed up I mean I added minced garlic, a couple of shakes of flaked red pepper, a 1/4 Granny Smith apple diced small and I tripled the mayo. Over night the 2.5 T called for in the recipe just wasn’t enough. I served it in a whole wheat pita with spring greens. I rarely like the results of tofu/marinade but I keep on trying. Your seasoning mixture was fantastic and you are right, ripping the tofu makes it look like the “real” thing. I let the tofu absorb the liquid completely before baking. By doing so I didn’t bake the liquid onto the pan instead of into the tofu or loose the liquid under the Silpat. Oh, I didn’t see your note about non-chicken broth, I just used homemade vegetable broth. And I too forgot the Almonds. Still a great recipe. Your recipe was my first attempt at making tofu “chicken” salad. It turned out great and I really liked it. I used veganaise mayo and a little chopped onion. This recipe is a keeper and I will definitely make it again. Susan….this was delicious! I need to work on getting more moisture out of my tofu (turned out more like a really wonderful egg salad for me) but the flavor was just really simple and wonderfully familiar! Thanks so much! I made this for myself, and my mother, who loves chicken salad, had a bite. So very impressed by it, she demanded that I make her a batch and when I forgot, she pressed me until I got it done (today, finally). I made it exactly as is, with optional ingredients included, and it is great! Folded in romaine, accompanied by some cold cubed watermelon, it has been such a relief on these warmer, almost-summer nights we’ve been having. Way to go, Mrs. V! 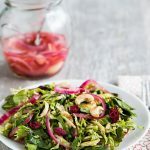 I LOVED this, I too have been hesitant to make tofu into a salad as a substitute and this was absolutely LIKE chicken salad.. was it the spices baked in? I think so. I will be making this regularly, it’s the best. Thanks!!! and thanks to Mom for the inspiration! Made this recipe the other day. It is delicious! I made it today substituting 15 oz. mashed home-cooked chickpeas for the tofu and added the rest of the ingredients. It is equally tasty but I like the texture using the tofu much better. The tofu version has become one of my new favorites. Thanks for another terrific recipe, Susan! Tried this weekend. It’s absolutely yummy. So is the tc-mayo. I made this today — it was DELICIOUS! I made it after we had already had a meal so it is sitting in the fridge overnight awaiting lettuce cups for tomorrow! (I must confess, however, I keep going to the fridge with a fork just to taste test!). I didn’t really measure anything and ended up putting a little to much relish in so it turned out sweet at first, but I just ended adding more mustard and it corrected itself. It’s just a lovely recipe — thank you so much for sharing. I wish it were tomorrow already. I have been wanting to try a tofu dish for a while, and this sounds great! I’ll have to give it a try and see what the family thinks. Thanks for sharing! This recipe is just awesome. Nice tip on tearing the tofu with our hands, didn’t know that. We make this recipe constantly, at least every other week. It’s a big hit in our house. Thank you so much!! Delicious! This really hit the spot for me. I’ve never been a chicken salad fan. But this was just perfect over crispy greens as a salad. I added some celery salt and green olives. And I used Twin Oaks organic tofu. It is really firm and has a lot less water to be squeezed out than the kind that come swimming in water. The result was perfect pieces of dense chewy tofu chicken. Tried it last night (for today’s lunch) and YUM. I, too, am a skeptic of tofu-based chicken salads (also tofu scrambles) and was fully prepared to like this fine, but not really love it… and I was wrong! The powerfully flavored herbs and baking really make this different, especially the sage. I will confess to having used light mayo instead of vegan mayo and added an extra splash of soy sauce to the final product, but I really don’t think that would make or break the recipe. 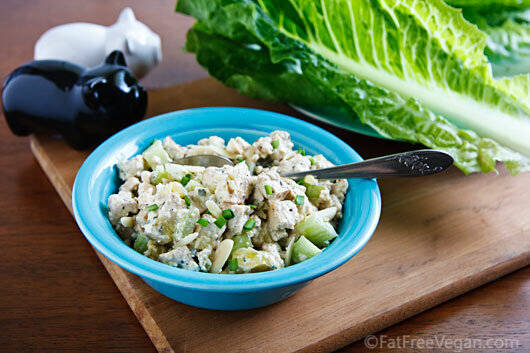 Charge forward and give it a shot, it’ll change your mind about tofu chicken salad! I want to make note that this very delicious salad, with a green salad, will be my dinner tonight. I also want to note that it’s December 19 and 70 degrees (!) outside (Thus, the dish is making an encore appearance at my table long before expected.). Made this last night so I could have a packed lunch for some long appointments today. DELICIOUS! I was a little nervous about the tofu since it wasn’t very chicken-y and didn’t have much bite, but in the salad it’s fantastic. Also, I left out the relish. Next time i make it, I’ll keep the relish out and add some blueberries. Yum! I made this tonight and it was really excellent! I served it open-face style on banana bread. Crazy, but good! 🙂 My non-veg husband loved it too! Wow, tofu salad on banana bread? Haha now I am very curious! I have made this recipe MANY times and it is so good. Those of you out there wondering if you should try it, please do. You will not be disappointed. This was sooooooo delicious! I doubled it and served it with lettuce and tomato rolled up in a flatbread! I also didn’t have any relish, but chopped up pickles worked great! I just made this for my family and they loved it! It was delicious! I just made this dish. Omg amazing thank you for posting. I didn’t bake the tofu, just marinated it, next time I’ll try that. Just made this. Yummy, even though I put in too much relish! Definitely make again. I put a pkg of tofu in the freezer to make it chewier next time. I sub’d poultry seasoning for the sage & thyme. This is delicious!